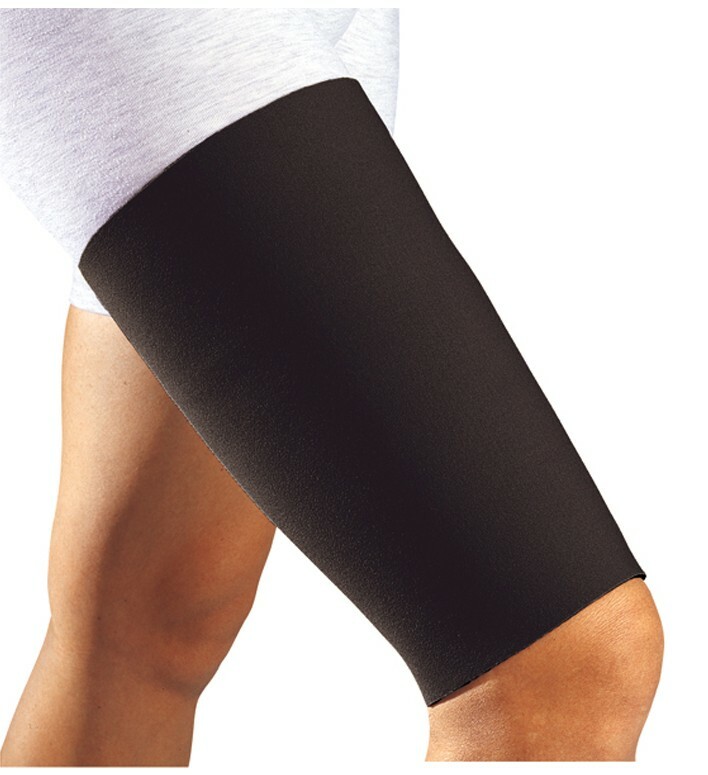 Thigh sleeve provides firm compression and soothing warmth for hamstring and quadriceps strain. Provides firm compression and soothing warmth for hamstring and quadriceps strain. Ideal for strains or contusions to the quadriceps, hamstring, or groin muscles. What is the circumference at the top and bottom? I have bought one compression sleeve from another company. While it seems to fit, it slides down very quickly - in walking just 10 steps. Will yours keep from sliding down? What are the materials in this product? I've had one made of neoprene and it was not that comfortable. I'm looking for something light weight to wear for a 12 hour shift. Thanks. This thigh sleeve is made of neoprene. Thank you for contacting Donjoy. This item is sold per each. need to know inches each size is???????????????????????????????????????????? This product kept slipping down my thigh, didnt help me. The thigh sleeve is much easier to put on than the ace bandage I was using. It does tend to chafe at the groin so I've been wearing it over my support hose which solved the problem. The brace worked well and I later moved to a 'groin support' brace. Works as intended...considering purchasing a "spare"
Really supports my hamstring area and improves my ability to play tennis. Kept muscle soreness at bay longer.